The Birmingham Zoo is home to over 700 animals from several continents, including 27 endangered species that it is helping to conserve through a cooperative breeding and conservation program. During 2002 Richards-Wilcox received a call from the hardware consultant, Marian Brasher of M.B.B. Architectural, who was to begin working on a new project: the Junior League of Birmingham’s Hugh Kaul Children’s Zoo. The Richards-Wilcox distributor, Karavan Doors, stated that the project was to be fast-tracked due to a tight schedule, and also required that all product be hot-dip galvanized for increased durability. 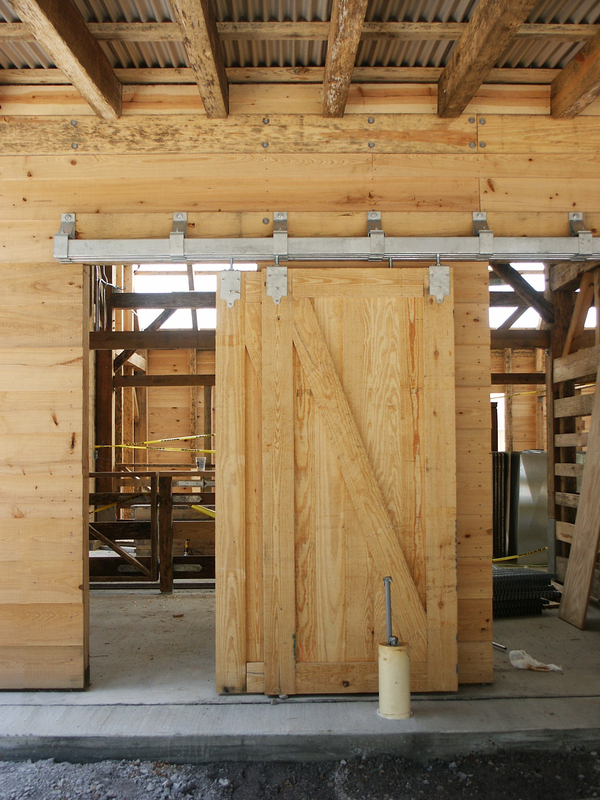 The project consisted of sliding door hardware sets for the single sliding and double sliding barn doors. Each set included sufficient track; sidewall mounting track brackets; hanger assemblies; end stops; bow handles; guide rollers and guider roller strips for the sliding doors. The project also included hardware for the swinging pen gates, which consisted of strap hinges; latches; handles and cane bolts. Richards-Wilcox was able to meet the challenging construction schedule and shipped on time. Depicted here is the stable during installation of the track and hangers for the sliding doors. Since its grand opening in August 2002, the Junior League of Birmingham’s Hugh Kaul Children’s Zoo has seen the spirited footsteps of many youngsters and is fulfilling the zoo’s mission: to help these children appreciate wildlife and promote the conservation of our natural resources.